If you're a science fiction fan like me then you've probably seen your fair share of the SCI FI Channel. I think I can even say without fear of marital retribution that the SCI FI Channel is hands down better than the Food Channel. One of the great things about the channel is that they fund their own "Original Movie" productions. And the movies they produce are great. 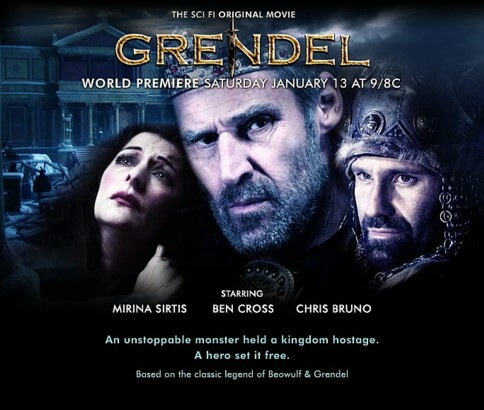 Take the case of Grendel, which debuted about ten months before Robert Zemeckis' Beowulf hit theaters. It was the exact right product at the exact right time. I'm so enamored of their productions that I wanted to find out what kind of people actually work for the SCI FI Channel. As luck would have it I was able to get in contact with Ron Fernandez, the screenwriter for "Grendel". Ron also wrote Rock Monster for the channel. Basically I got out of school with no idea what to do next, so I locked myself away in a small apartment near the beach and just wrote screenplays for five years. I had to teach myself the craft and discipline of writing, watch a lot of movies, make a lot of mistakes, and in that process I showed my work to enough people to convince them (and myself) I really was a good screenwriter and filmmaker. The jobs slowly came through relationships and referrals. A few were 'SC, most weren't. To me you have to be a 1000% great at your art, but it helps to have genuine connections with friends. Partner with one or two people whom you hope to work with for a long time, and build together. It is also a good idea to connect with people who are more successful (and happy?) than you. They may never help you get a job directly, but these are the people to emulate. You learn how to talk and act in a way that gets movies and projects MADE that isn't a lot of hot air. Some people just want to have meetings and develop things endlessly. Flee from them. As you know it is so tough out there and there's things I wish I had known then. Like you need to stay in touch with everyone you met in school and share whatever connections you have. You need your team of friends and supporters to build a decent life here, as well as a life outside Hollywood.